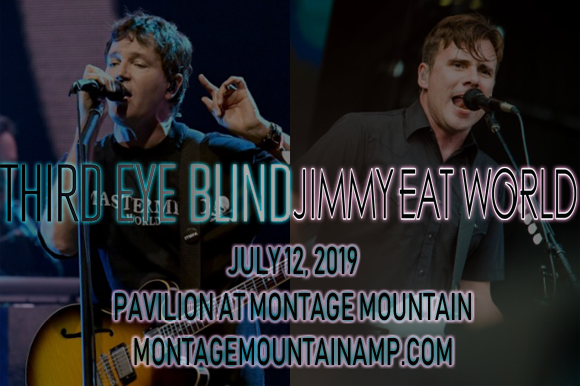 Indie-rock fans have yet another incredible co-headlining tour to look forward to this summer as Third Eye Blind & Jimmy Eat World embark on an epic team-up, coming to Pavilion at Montage Mountain on Friday 12th July 2019! The Summer Gods Tour sees a headlining set from each band, plus support from Ra Ra Riot! Formed in Meza, Arizona in 1993, American rock band Jimmy Eat World consists of lead guitarist/lead vocalist Jim Adkins, drummer Zach Lind, rhythm guitarist/vocalist Tom Linton, and bassist Rick Burch. On their self-funded 1994 self-titled debut album, the group signed with Capitol Records in 1995, releasing their major-label debut, Static Prevails, the following year. They released a follow-up with Capitol, Clarity (1999), but decided to work on their fourth album without label support. The result was 2001's Bleed American, which served as their breakthrough album, launching four top twenty singles: "Bleed American", "The Middle", "Sweetness", and "A Praise Chorus". "The Middle" reached the number-one spot on the Billboard Modern Rock Tracks chart and number five on the Billboard Hot 100, introducing the band to a larger audience and helping the album to reach platinum status. To date, the band has released nine studio albums, including 2007's Chase This Light, which is the band's highest charting album to date, peaking at number five on the Billboard 200. Their most recent release is 2016's Integrity Blues.